Australian rules football is a sport created in Australia. It is the national sport and is the most popular sport in Australia. The main league of Australian rules football is the Australian Football League. In 1858, Tom Wills, a former student of the Rugby school and Cambridge College, created a set of football rules that were like a cross between rugby, soccer and Gaelic football. He made up the game for cricketers to keep in shape during the off-season (winter). Wills had help in making up the game from other people like his cousin H.C.A. Harrison, and W.J. Hammersly and J.B. Thompson. Wills grew up with Indigenous Australians. He spoke the language of the people who lived near him and played with the children. 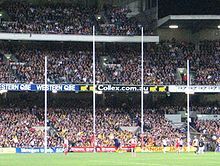 It has been suggested that Australian Rules Football is based in part on Marn Grook, an Aboriginal game with some similar rules to Australian Rules Football. Because the indigenous people Wills played with as a child would have played Marn Grook, Wills would have been influenced by this game when creating the rules for Australian Rules Football. The Melbourne Football Club was founded on 14 May 1859; the Melbourne Football Club is one of the oldest surviving football clubs in the world. A game of football was played between Scotch College and Melbourne Grammar School. It was played over three days on an oval next to the present day Melbourne Cricket Ground, and the two schools have played an annual game ever since. This game became known as Melbourne Rules Football, one of many local varieties of football that existed at that time, another notable one being Sheffield Rules Football. Then following its decision to not join either the association rules (1863) or rugby rules (1871), it became known as Victorian Rules, although it closely resembled the two former rule sets. Then in the 1880s as rugby and association rules began to diverge in a much greater way, Victorian Rules which resembled the 1850s type of football that both rugby and the association had based their rules on remained much the same except for moving to oval fields from rectangular fields and eventually introducing more posts. After the sport became popular in other states, people started calling it "Australian Rules". The Victorian Football League ( VFL ) was created in 1896. The next year, the first official games were played. The first clubs were Carlton, Collingwood, Essendon, Fitzroy, Geelong, Melbourne, St Kilda, and South Melbourne. In 1908, Richmond and University joined. University left after the 1914 season. In 1925, Footscray, Hawthorn and North Melbourne joined the VFL. Brisbane Lions (1997, when the Brisbane Bears and Fitzroy Lions merged). In 1990 the Victorian Football League was changed to the Australian Football League (AFL). Footscray changed its name to the Western Bulldogs in 1997. North Melbourne changed its name to the Kangaroos in 1999, but changed back in 2008. Football is the most popular sport in Australia, with crowd attendances of 50-80,000 people common to normal home and away matches and capacity crowds of 100,000 people at the home of football the MCG during the finals and special matches. The record crowd still remains at 121,696, who watched that most history-making of all Grand Finals in 1970, between Carlton and Collingwood, where Carlton came from a 44-point deficit at half-time to win the game by implementing an entirely new system of play, handballing out of the backline, which changed the game forever, and marked the beginnings of the transition of the game from one of a 'territorial' base to 'possession football'. There are 16 teams in the AFL . Each team has 22 players during game day with team lists of 40-45 players.During the game, each team has 18 players on the field, consisting of 6 forwards, 3 centres, 6 backmen, and 3 followers. The 4 remaining players are reserves three of which can be interchanged with any other player in the team as often as the coach wants. The forth can replace a player but the replaced player can not come back on to the field of play. Every game consists of 4 quarters, being 20 minutes and overtime (stoppage time, time-keepers acting upon central umpire signals to determine how long). After every quarter the teams swap direction. The quarter is started when the umpire blows his whistle and bounces the ball in the middle of the field (similar to a basketball "tip")and opposing players try to tap or punch the ball to their team-mates. The idea of the game is to kick more goals than the other team. At each end of the field are 4 poles. Players score points by kicking the ball between the poles. A goal is a kick between the centermost posts. It is worth 6 points. A Behind (worth 1 point) is a kick that goes between the outer posts. Players can bounce the ball and hit it with their hand (handball it) to other players . If a player catches a ball after the ball has been kicked in the air by another player, then this is a "mark" and the player cannot be tackled until he plays on. It is the only "football" code where the major score can ONLY be scored with the foot. Wikimedia Commons has media related to Australian rules football. ↑ W. F. Mandle (1976). "Wills, Thomas Wentworth Spencer (1835 - 1880)". Australian Dictionary of Biography. Australian National University. Retrieved 2008-11-25. ↑ "Gold Coast SUNS". goldcoastfc.com.au. 2012. Retrieved 8 March 2012. ↑ "Greater Western Sydney Giants". gwsgiants.com.au. 2012. Retrieved 8 March 2012. This page was last changed on 10 March 2018, at 05:51.